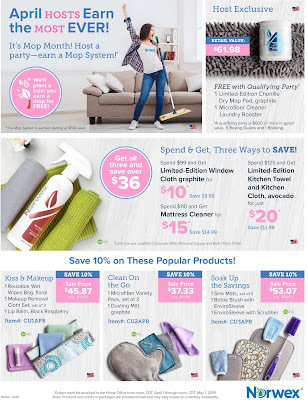 Spend & Get, Three Ways to SAVE! GET ALL 3 AND SAVE OVER $36! **Limit one per qualified Customer, Web, Personal Supply and Bulk / Party Order. Orders must be received in the Home Office from noon, CDT, April 1, 2019 through noon, CST, May 1, 2019. Note: Products and colors in packages are predetermined and may vary based on inventory availability. We Plant a Tree. You Earn a Mop System Free! In celebration of Earth Day, when you host a party in April, we’ll plant a tree in your name. Help us plant 50,000 trees! 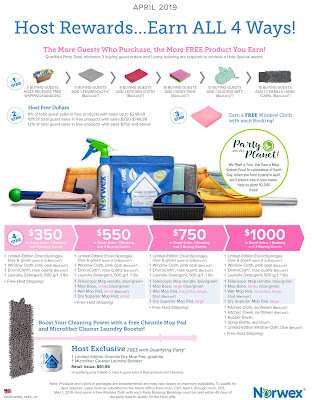 Boost Your Cleaning Power with a Free Chenille Mop Pad and Microfiber Cleaner Laundry Booster! To qualify for April Specials, sales must be submitted to the Home Office from noon, CDT, April 1, 2019, through noon, CDT, May 1, 2019.